electro-music.com :: View topic - Why is my Lunetta not working? In my latest device - the Atari Jazz Console V2 - I've got clock crosstalk going on. /.../ COULD, the fact that they're each 3 to 5 millimeters away maximum, make THAT much difference? I'm not sure, it could make a difference. Traces may be picking up electromagnetic fields from adjacent traces. These fields would increase with higher current. As Top Top has experienced that signals still work with 10k inserted, you might try insert a resitor into the clock lines and see if it reduces the problem. I DO have 0.1uF caps for each chip. COULD, the fact that they're each 3 to 5 millimeters away maximum, make THAT much difference? Are the rails for the clocks dead ends, or do other things hang off them further down the track? Question about pulldown/pullup (?) resistors - I notice that my 4093 oscillators do some weird stuff if there is no gate source connected to the gate input. They just kind of run wild. Same with the 4017 - goes nutty if nothing is connected to the input. Would a 100K (or some other value) resistor from the gate input to ground solve this problem so that it will remain silent when it does not have a gate source connected? And would that resisltor interfere with normal gate operation when a clock/gate source is connected? Otay. Thank you for that thot, chief. I'll give it a whirl. Power comes to this module from my star configuration and that's it. 10uF caps on the module inputs and 0.1's for every chip. My lack of full knowledge is suspecting 'feed through' from all of the wiring flying about everywhere, as a possibility. In laying traces out, I do also try to keep something of a distance between everyone, but I wonder if that too, could be a factor in it. Yes. Open CMOS gates are very vulnerable for picking up things because of the high impedance. 220K would be enough too in most cases. with resistors are connected to it, the lower the resistance will be. So it would start to lack output power. Its not a huge issue, but i've heard momentary silence on a few of the clips of your lunnettas out there but when mine comes to a place where silence is what i'd expect to hear, via gates and what not, i just get that familiar 60 hz ground buzz. any one know a fix? very few of my inputs are tied down or up with resistors, i noticed my 4040 worked poorly when tied so i stopped. and no caps betweens v+ and ground on my chips. I'd assume these items listed above would be the usual course of action to take but i feel like some one might be able to suggest something different. on a different note- my 4093 oscs are totally weird and just spit out a bunch of pitched noise instead of pitched square waves. I will admit the noise is AWESOME but makes the oscs unusable when i'd like to patch them into other digital cmos chips. any similar experiences? 1 osc gated to V+ (high) which connects to a lug of a switch which allows either the first osc or an external input into the next gated osc. Clean up that power supply stolenfat! Electrolytic filter caps and ceramic bypass caps before the regulator and ceramic bypass after the regulator. I use ceramic bypass caps on the V+ of each chip as well. I sometimes use separate boards for my Lunetta - and I have smaller electrolytic caps on the power supply entrance to each board. thanks for the tip bruce, its sad to think i'll have to ditch my snes power supply and design my own. I am literally just jumping power from some resistor on the pcb and grounding to the giant heat sink. see its true! ...just sucking power from the old guts of a broken SNES from a failed circuit bending experiment. But... what to do with my empty spaces? Looking good stolenfat! Can't wait to hear clips when ya get her up and running. This may be your friend. It is set to output about 8.5v, but by adjusting the two resistors, you can get any positive voltage, as long as your input voltage "raw" is a couple volts higher. I started using these on things I am building using a regular wallwart and so far they have been very quiet. It is set to output about 8.5v, but by adjusting the two resistors, you can get any positive voltage, as long as your input voltage "raw" is a couple volts higher. First, I'm new here, and would like to throw out a big thank you to everyone who contributes here. It's awesome that you guys all share your knowledge and help those who'd otherwise not be able to come up with such stuff make cool sounds! A bit more on topic, I have sort of a "ghost in my machine", which I suspect to be a grounding/power problem, but can't seem to work out what I'm doing wrong. I have aluminum panels, and it almost seems like there is a charge sitting on them. When I connect, say, a 74HC393 divider (built off the Castle Rocktronics page), turning knobs on different panels including unpowered/unconnected knobs results in the divider glitching out. After a few seconds of turning, everything acts as normal until I keep my hands off for 10 seconds or so, then it happens again. I can also defeat whatever's holding this charge by simply touching the front panel while twiddling. All the panels are grounded via wire connected to the ground pin of each individual module's power header, and all of them appear working when I use a continuity tester from each panel to star ground (a piece of vero with headers and filtering caps on it). The power supply is a 9v adapter, but outside of the mixer, each module has it's own 5v regulator + associated caps, and all the chips have 100nf decoupling caps. So, a few questions... anyone know what this is? Would grounding the front panels in a different way, ie directly to star ground themselves and not to the power header somehow help? Should the ground wires be connected before or after the regulators, filtering caps, etc., or does it not matter? To be sure, grounding is a big issue and your problem does sound like a grounding issue (touch and it works is always a symptom). If we had a schematic of the system, that might help us help you. Generally, however, grounding problems can be very difficult to flush out. It sounds like construction-wise, you're focusing on some good things, the star configuration is the best. The center of the star should be at the PSU. Daisychains for grounds to different things should be avoided; separate wires heading back to the star-center (PSU) are best. Ground problems are not to be considered isolated to module grounds, one must also consider the grounding that takes place within the modules. Those are also best to create stars. I've had chip grounding problems due to a bit of crap on a chip pin that prevents a good solder connection. This can occur with any soldered part. Chip sockets can also cause such problems. Mechanical grounds are also a source of problems. It is not a good idea to allow the panel to be the ground conductor for connectors. While you can bolt jacks to a panel it is always better to wire the jacks' grounds instead of just bolting them all to a panel and only grounding the panel assuming the panel acts as a wire. It can work as a wire, but might not do that forever due to corrosion or vibration or heat/cool flex that loosens screws and nuts. Another perennial problem that occurs often in the lunetta world is the misuse of virtual grounds. Be careful with these, they are poor grounds to start with because they can't sink or source very much current. The general rule of thumb is that the virtual ground should support very few chips, the number depends on the circuit. Lunettas tend to grow over time and if a virtual ground is at the heart of a lunetta, instability and noise can be a result. Lunettas can benefit from a true dual voltage supply (instead of using a virtual ground). One common type is to supply +5 and -5 regulators. CMOS can easily withstand 10 volts, so such a supply can work and provides a super solid ground. Such a supply can allow enormous growth of a lunetta without sacrificing current sink and source to and from ground. Sorry for the lack of info. Pretty much all the modules are off of the Castle Rocktronics site (http://castlerocktronics.com/modular.html). The only modifications I made are that I used a 4069 for make up in the r2r network and that I added switches to the shift register so that I could have them cascade without needing to plug them in. The modules are built on vero/tagboard. I'm using banana jacks everywhere, so the only components that come in contact with the panels are the casings for the pots. The only module using virtual ground at the moment is the mixer, and the symptoms happen irregardless of whether or not that module is plugged in. I had a similar problem before I grounded the panels, but after they were connected it went away. Two days ago I took out a module, and when I put it back in the problems returned, but everything appears to be exactly as it was, at least according to my DMM. When you mentioned everything being connected to star ground, should I then connect the panels themselves directly to the ground on the strip with the power headers on them? As it is now, I have the ground split between the module and the panel where the power cable connects to the module, before the 5v regulators and associated caps. This may be a shot in the dark, not knowing your whole setup, but behaviors like the one you are describing can occur with floating CMOS inputs. Do you have pulldown resistors on your inputs? Thanks for answering. Yes, I have 100k pulldown resistors on all inputs. If nothing is attached to anything else, nothing glitches. With the divider run off an 40106 LFO, it'll glitch wherever the LFO is in the cycle. When I run the divider off a 4015's output, it only becomes glitch-able when the 4015's output is high. The way the LEDS react, though, is similar to when I have a cable plugged into the divider input and touch the other end with my fingers. Floating inputs would have been my first guess too although the behaviour is very odd. Yes, they're all standard CMOS (2x 40106, 4015, 4069), with the exception of the divider which is a 74HC393. Is there any way this could be related to drawing to much current, or is that nonsense? Each 78L05 is powering only one chip, but I did make the mistake of using standard LEDs, since I only caught on about using ultrabright LEDs after I had already built everything up. In case it's relevant, the 9v power adapter is running into a 4700uf cap with a 100n bypassing it before they branch out to the individual modules. CMOS chips themselves hardly draw any current (which is one of the main features of CMOS) but LEDs can depending on the series resistors you used. that could indeed cause some weird behaviour. Just something to be aware of - low current is true of CMOS when used as logic. However, linear amplifiers and integrators are different. Not like they draw amperes, however, a substantial amount more current. This is because as logic, one output transistor is off and it's resistance is many millions of ohms. When used as an integrator or linear amplifier, the transistors are both turned on to some degree. The worst current occurs when the gate is driven at a voltage of ( Vdd - Vss ) / 2. Different gate types will draw different amount of current when used in this analog manner. 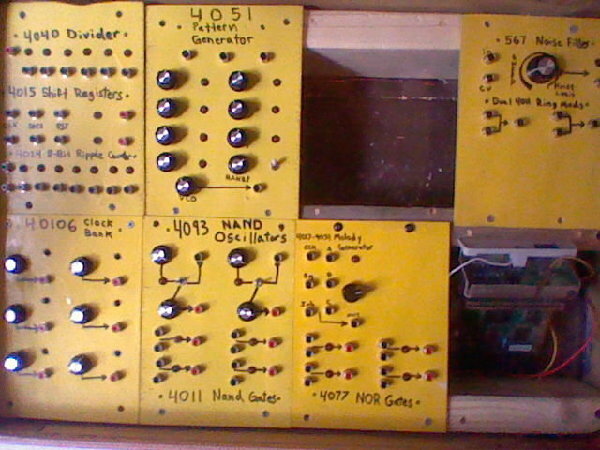 4069 "fake" opamps and 40106 oscillators fall into this category. I've had 4069 chips get pretty warm used this way which is a symptom of current draw. Thanks Jovian and PHOBoS for you answers! I rewired all my panel grounds to be connected to the center of the star using thicker gauge wire than the actual power cables to the modules, but it didn't change anything. It think I found at least part of the problem, though. Cheap pots. Once I put knobs on on the pots, I can't get things to glitch out anymore. I'm guessing this means the pot posts are intermittently connecting me to whatever signal is passing through them? There is a definite hole in my theory, though, and that's that I can still turn a pot by hand that's wired to a completely disconnected module and get things to glitch. Touching the panels themselves doesn't have the same effect, although I guess that could have something to do with a difference in resistance between my finger and the surface of the panel vs my finger and the metal of the pot shaft. For now, I guess it would be simple enough to put knobs on or replace the pots with something a bit better, but given that I plan on expanding my machine quite a bit, I'd like to figure out why this happens so it doesn't become a bigger problem in the future. Do you guys have any insight on this?